Opening Times: Mon, Wed, Fri 1800-2200, Sat-Sun throughout the day (exact times unknown). Club times (exclusive) Tue & Thu 1800-2200, Sun 1000-1200. Track is used by local schools and Wyre Forest sports development Mon-Fri 0900-1800 but may be used by the public by prior arragement. Stourport AC (now Kidderminster & Stourport AC), Stourport Hockey Club and Stourport High School were awarded a Lottery grant for a new track which opened for training in October 1999 and the official opening meeting was in early May 2000. The old redgra track was replaced with with two astroturf hockey pitches and tennis/netball courts and was on the opposite side of the road (Kingsway). There is a clubhouse which is fully licensed and contains a meeting room, function room and a bar. It is available for functions, wedding receptions, parties etc. A covered stand is planned to be built in the future when sufficient funds become available. 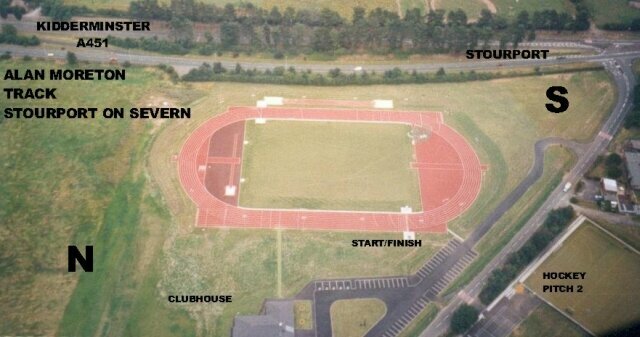 The track is named after Alan Moreton, the long serving secretary of Stourport AC, who died in the late 1990s. The main contractor was Blakedown Landscapes Ltd. of Hartlebury and the track was laid by Polysports Ltd. The track is situated in very pleasant rural surroundings, just off the A451 on the outskirts of Stourport.